About the series: Jim Henson’s The Dark Crystal: Creation Myths is an original graphic novel hardcover series set one thousand years before the crystal cracked, before the world of Thra fell to strife and destruction. Original Dark Crystal movie concept designer Brian Froud plots, provides the cover, designs characters, and art directs this beautiful hardcover. Written by Brian Holguin (Spawn), and illustrated by Alex Sheikman (Robotika) and Lizzy John. The synopsis: The Great Conjunction is at hand in this dramatic second volume of Archaia and The Jim Henson Company's trilogy of prequel graphic novels that tell the origin of The Dark Crystal. Aughra, the beloved guardian of Thra, has gone into hiding, while her son, Raunip, leads a team of emissaries to the Crystal Castle. There they will bear witness as the visiting Urskeks attempt to use the Conjunction to power their voyage home. But pain and mistrust fostered by the group leads to events that will corrupt the world to its very core and transform the Urskeks into two distinct races: the gentle urRu and the terrifying Skeksis. 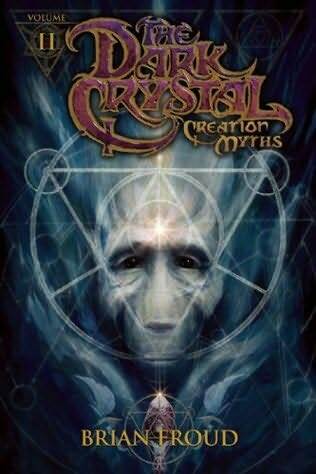 Brian Froud, legendary fantasy artist and conceptual designer of Jim Henson's The Dark Crystal film, returns to oversee this crucial chapter that reveals the tragic events that caused the Bright Crystal to darken and shatter.